The National Transportation Safety Board said the team heading to Massachusetts to investigate a series of gas explosions blamed for one death and dozens of fires in three communities is expected to remain on the scene for a week. The agency said in a series of tweets Friday that the team will be gathering perishable evidence from the accident site and pulling together information from federal, state, and local agencies, and Columbia Gas. The agency says that among the issues being examined by NTSB investigators are the design of the pipeline system, any upgrades made to the system and the operator’s management of the pipeline. As is routine in NTSB investigations, a review of the emergency response of the operator and local first responders will be conducted. Officials are saying it could take weeks before residents of three Massachusetts communities torn by natural gas explosions could have their service fully restored. Gov. Charlie Baker said Friday that more than 100 gas technicians are being deployed throughout the night and into Saturday to make sure each home is safe to enter. He says no one in the area should turn on their gas unless a crew turns it on for them. Baker says Eversource is bringing in additional resources. Earlier on Friday, Baker authorized the utility to take management control over the effort to safely restore services. U.S. Sens. Elizabeth Warren and Edward Markey are calling for a Senate hearing into the natural gas explosions that ripped through three Massachusetts communities. The Massachusetts Democrats on Friday urged the Senate’s Commerce, Science and Transportation Committee to schedule the hearing. The committee has jurisdiction over the Pipeline and Hazardous Materials Safety Administration, which regulates natural gas transmission lines, and the National Transportation Safety Board, which investigates pipeline accidents. Markey and Warren say the hearings should include representatives from Columbia Gas, the company whose pipelines exploded, to determine what went wrong and how to make sure it doesn’t happen again — and whether regulators have adequate authority and resources to detect violations. Thursday’s explosions killed a teen driver, injured at least 25 others, and left dozens of homes in ruins. The utility company that services the Massachusetts communities damaged by natural gas explosions has been fined $100,000 by the state for a variety of safety violations since 2010. Columbia Gas of Massachusetts was fined $35,000 by the Department of Public Utilities in 2016 for failing to follow company and pipeline safety regulations when responding to an outage and repairing a leak in Taunton. In 2011, it was penalized $15,000 for failing to install a new line in Brockton at the required depth. The company paid $15,000 that same year for failing to provide crews in Attleboro with adequate maps and records, among other violations. He declined to comment on the suspected cause of the blasts, citing the National Transportation Safety Board investigation. Columbia Gas of Massachusetts President Steve Bryant spoke to reporters Friday, shortly after the mayor of Lawrence sharply criticized the company for not providing more information and answers. Bryant isn’t commenting on the suspected cause of the explosions, noting that the National Transportation Safety Board is investigating. Bryant says the company is working to shut off service to all roughly 8,000 affected customers. He says Columbia Gas has set up a claims hotline for customers and will also be opening a claims center in Lawrence. The blasts Thursday are being blamed for more than 60 fires, a death and about 25 injuries. The mayor of a Massachusetts community affected by a series of natural gas explosions is heavily criticizing utility Columbia Gas. He says his fire and police chiefs have not gotten any answers from the company. Columbia Gas services Lawrence, as well as Andover and North Andover. Republican Gov. Charlie Baker backed Rivera and said he was declaring a state of emergency so the state could take over recovery efforts. The teenager who died when a brick chimney dislodged by a gas explosion fell on his vehicle had received his driver’s license just that day. Authorities identified that victim of Thursday’s series of explosions in Massachusetts as 18-year-old Leonel Rondon, of Lawrence. The state Registry and Motor Vehicles and Rondon’s friends say he had just received his license Thursday. Christian Caraballo tells The Boston Globe he was in the vehicle when the chimney fell in the driveway of a friend’s house. Three other young men in the vehicle got out and tried to move the chimney but couldn’t. Friends say Rondon was a senior at Lawrence High School. The CEO of a hospital in one of the Massachusetts communities affected by a series of natural gas explosions and fires says it treated 13 patients. Dianne Anderson is CEO of Lawrence General Hospital. She says it dealt with injuries ranging from smoke inhalation to blast trauma. Most patients were treated and released, but one was flown to a Boston hospital and one remains at Lawrence General in serious condition. Dr. Earl Gonzales says that patient requires additional surgery. Anderson says the hospital trains for and is prepared for such situations. Authorities say one person was killed at least 25 were injured in the fires Thursday in Lawrence, Andover and North Andover. A subsidiary of the parent company of Columbia Gas of Massachusetts was blamed by federal investigators for a 2012 pipeline rupture and explosion in West Virginia. The explosion destroyed three homes and sent flames shooting into the air. The pipeline was operated by Columbia Gas Transmission Corp., which at the time was owned by NiSource. NiSource is the parent company of Columbia Gas of Massachusetts, which services three communities where a series of fires and explosions killed a teenager and injured more than two dozen others on Thursday. The National Transportation Safety Board said that the West Virginia rupture likely could have been prevented if the pipeline had been inspected or tested, but that it hadn’t been since 1988. Investigators also said Columbia Gas Transmission’s response to the rupture was delayed. 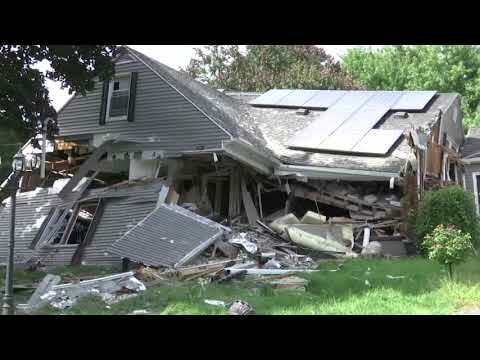 A Massachusetts man who spent the night in a shelter because of the risk of a gas explosion at his home says the ordeal was more confusing than frightening. John Fluegge was one of about 100 people who spent the night on a cot in the North Andover High School gymnasium, which was converted into an emergency shelter. The 58-year-old man said Friday he came home Thursday to find a note on the door of his apartment building telling everyone to leave because the gas and electricity were being shut off in response to several gas explosions and fires in the town. His apartment was not damaged but he has still not been allowed to return because there is no power. One person was killed and about 25 were hurt. The head of the Massachusetts Emergency Management Agency says firefighters responded to 60 to 80 structure fires in the three communities affected by a series of natural gas explosions. Kurt Schwartz said Friday that firefighters in Lawrence, North Andover and Andover responded to about 150 emergency calls Thursday. He says about 400 people spent the night in emergency shelters and no additional natural gas-related emergencies have been reported Friday. The exact cause of the fires and explosions remains under investigation. Gov. Charlie Baker said hundreds of natural gas technicians have been deployed throughout the area to go house by house to ensure they are safe. The Republican governor says he realizes the situation is a “massive inconvenience” but asked for patience. An 18-year-old man died and at least 25 people were injured in the fires and explosions. The National Transportation Safety Board is sending a team to Massachusetts to investigate a series of gas explosions blamed for one death and dozens of fires. An agency spokesman said during a news conference in Washington on Friday that pipelines are within the agency’s jurisdiction. The spokesman says among other things, the agency will look at the design of the pipeline system, maintenance and upgrades that have been done, and the safety record of the pipeline operator. The agency’s job is not to lay blame, but to determine what happened so it can be prevented from happening again. The explosions were reported in the communities of Lawrence, Andover and North Andover north of Boston on Thursday afternoon. The series of explosions and fires in Lawrence, Andover and North Andover killed a teenager, injured at least 10 other people and ignited fires in at least 39 homes. The company says it needs to visit each of the 8,600 affected customers to shut off each gas meter and conduct a safety inspection. About 18,000 customers in the region also had their electricity shut off in response to the explosions and many residents spent the night at shelters in area schools. Authorities say an 18-year-old man has died after a house exploded amid gas explosions north of Boston, sending a chimney crashing into his car. Officials have identified the victim as Leonel Rondon, of Lawrence. They say he was rushed to Massachusetts General Hospital in Boston, where he died around 8:30 p.m. EDT of his injuries. Gov. Charlie Baker says 10 other people were injured Thursday in a series of fires and explosions that authorities blame on over-pressurized natural gas lines.